Click to view any of the images full screen and then use your back button to return to the story. I sat in the car, shaking uncontrollably, feeling nauseous and staring failure full in the face. In the last thirty minutes, the sun had set, the temperature had dropped from a lovely 22°C to just 8°C and I’d gone from feeling OK, to terrible. I turned the engine on, dialed the heater up to full and set about the task of eating, despite feeling sick. This was a full scale bonk* and I had no idea whether I could recover from it or not. [* bonking is a cycling term for running out of energy. It’s the same thing as a marathon runner hitting the wall. It’s symptoms are unexpected sweating, nausea, complete loss of appetite, dizziness, shaking and you may just fall over. It’s not a lot of fun]. 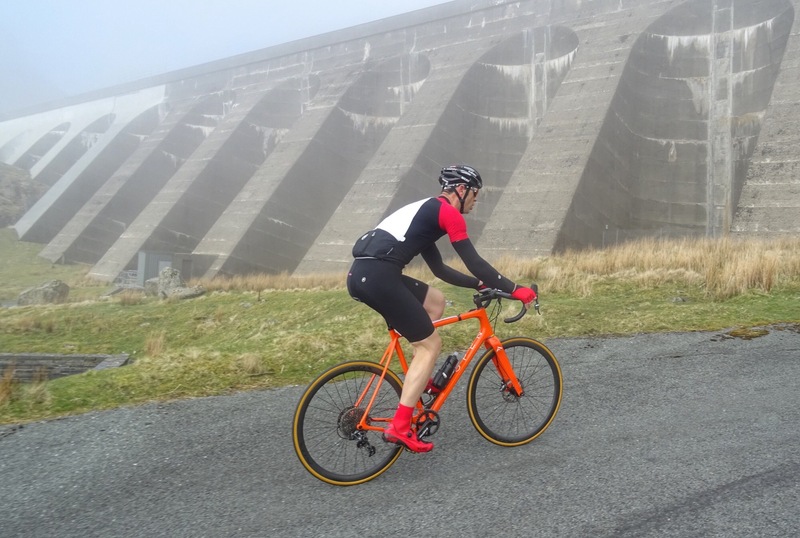 Some 12 hours earlier, around 9.00am, I’d clipped in, pushed away from the gate at the bottom of the climb, shifted quickly into first gear and settled into the rhythm of an Everesting attempt. As always, all the stresses of preparing for the ride fell away as I got down to the business of simply riding my bike. This was the good bit, the moment that I always savoured. The mountains were silent, the views incredible and my riding partner for the day, Kev and I chatted away. I gave him a running commentary on what to expect around each bend. He’d never ridden Stwlan Dam before and I was like an over-excited tour guide. The road to Stwlan Dam is a truly remarkable one. Anywhere in the world it would be special, but for the UK, it’s arguably unique. 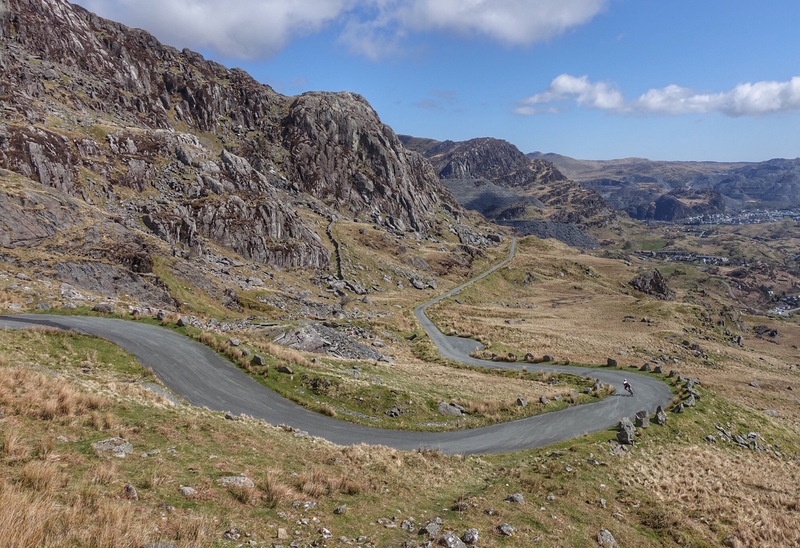 It’s my nomination for ‘Best Road Climb in the UK’. 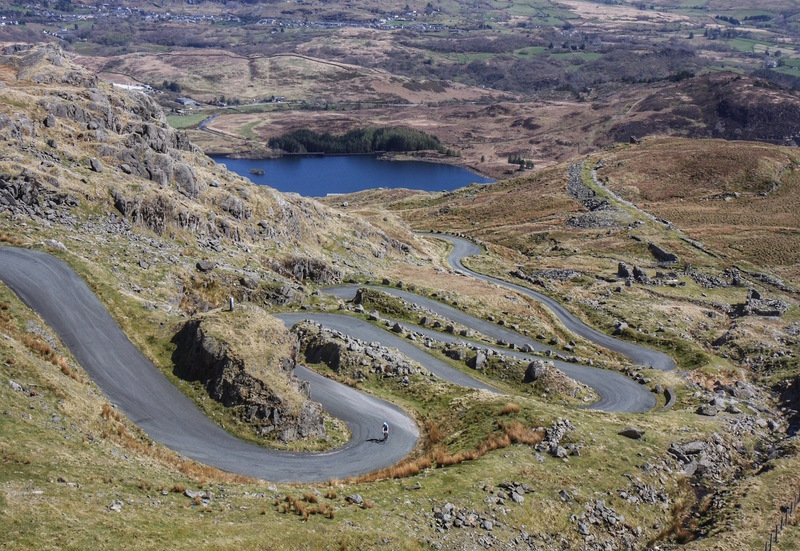 For a start, it has hairpin bends and not just one or two of them, but nine. Yes, NINE. The first two come around the two km mark, but then, close to the top, seven of them are stacked one on top of another. Descending them would become almost hypnotic as the day went on. 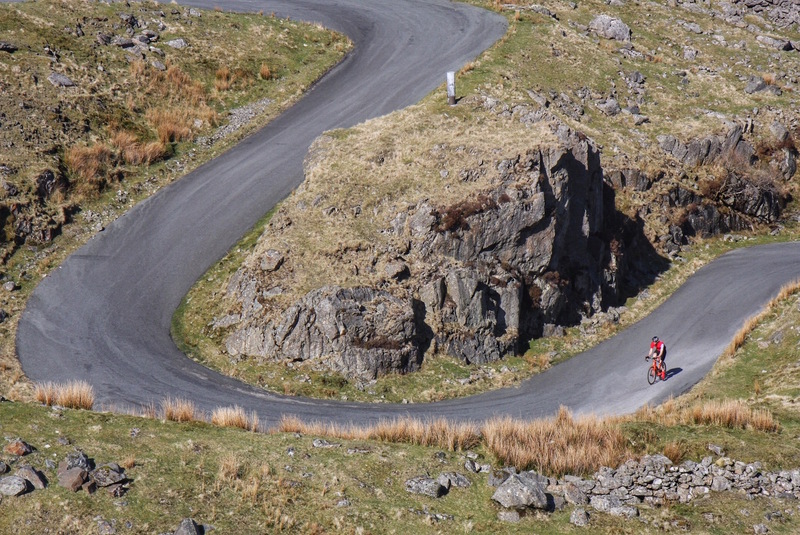 It’s a very un-British road: we don’t build hairpins, particularly not series of them. It’s like a little piece of France, somehow transported to the UK and this is ironic, since a French electricity company actually now owns the road to Stwlan Dam! Lap two and the fog is just burning off. The next amazing thing is that the road is a dead end i.e. a summit finish. We don’t have many of those. It was constructed back in the 1950s, as an access road for the building of the dam, which created the upper lake of a hydro-electric project. Even better, it’s a private access road. It doesn’t even appear on Google maps. It’s gated and said gate is securely locked. You’ll find the odd sheep on the road, an occasional dog walker and maybe even a company vehicle checking the dam, but that’s it. In 24 hours on the hill, we saw one vehicle and three other cyclists. If you like peace and quiet, surrounded by beauty, then this road is for you. Basecamp and the start of the climb to Stwlan Dam. So, ‘Beauty’ explained. Now to describe the ‘Beast’. The climb is hard. 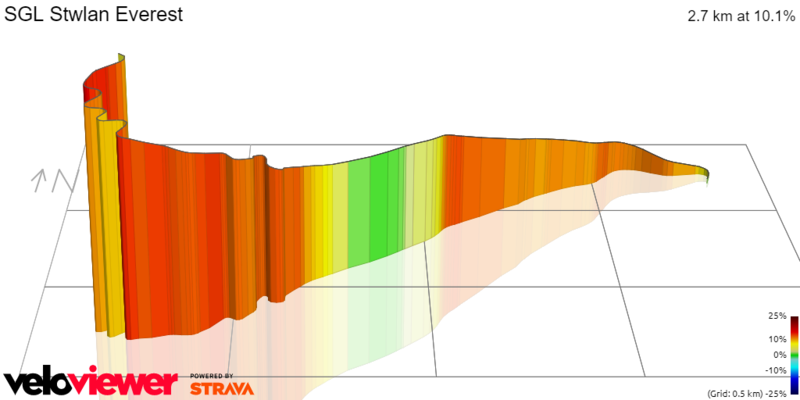 Hard as in 2.7km at 10.1% average (for those local to me, that’s a steeper average than Whiteleaf…). But the reality is worse still because there’s a virtually flat section around 1.5km, which lasts for c.350m, meaning almost all of the climbing is actually between 12 – 14% and the very last ramp to the summit nudges 16%+. 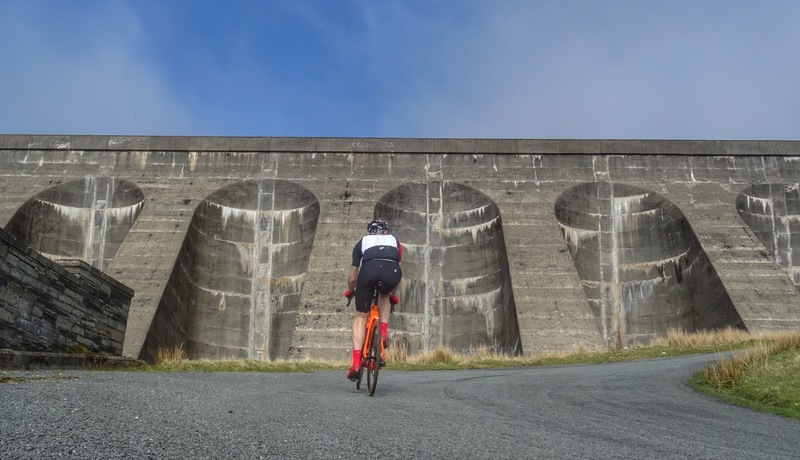 You’d better bring your climbing legs to Stwlan Dam. The final hairpin. This can’t really be in Wales can it!!?? 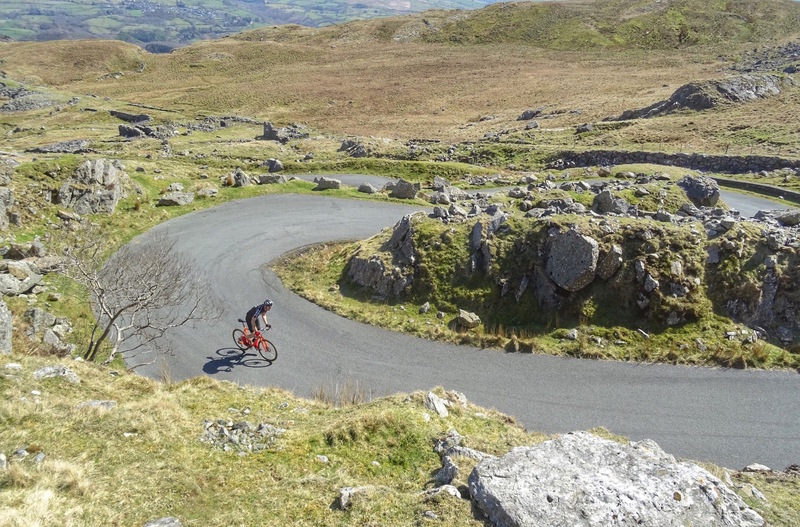 I first heard about the road in February 2017, when Simon Warren, the author of ‘100 Greatest Climbs’, released his ‘Wales’ edition in the series spawned from the original book. 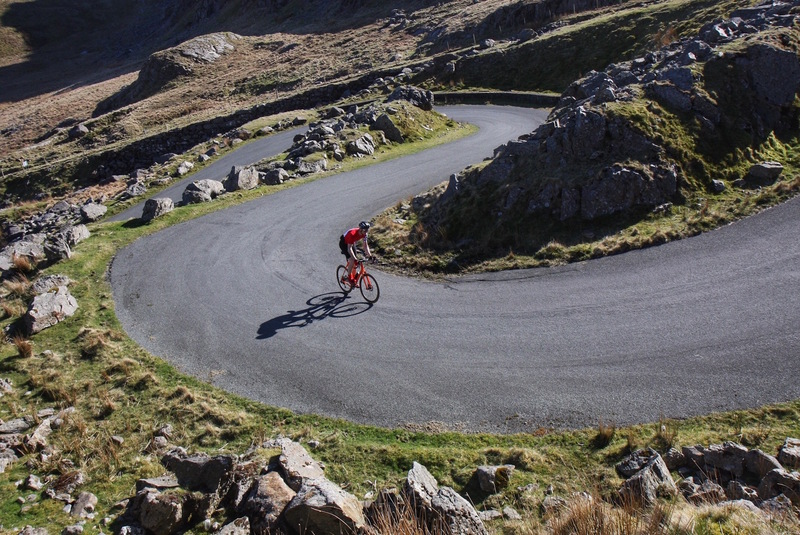 In it, he declared that he had now found the ‘Holy Trinity’ – his best three climbs. In Scotland, he gave the nod to Bealach na Ba, which I’d not ridden, but had heard lots about. England’s best climb was noted as Great Dun Fell, which seemed fair enough. 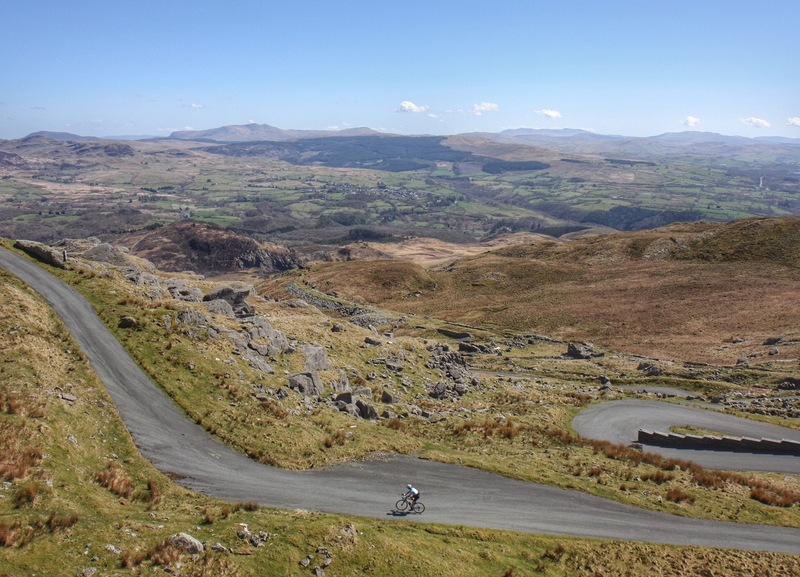 Wales though, is a place I know really well, so how could he be naming a climb I’d never heard of? Stwlan Dam? The picture of the hairpins was enough to capture my imagination and within a few days, I’d driven the 4.5 hours from London to take a look. 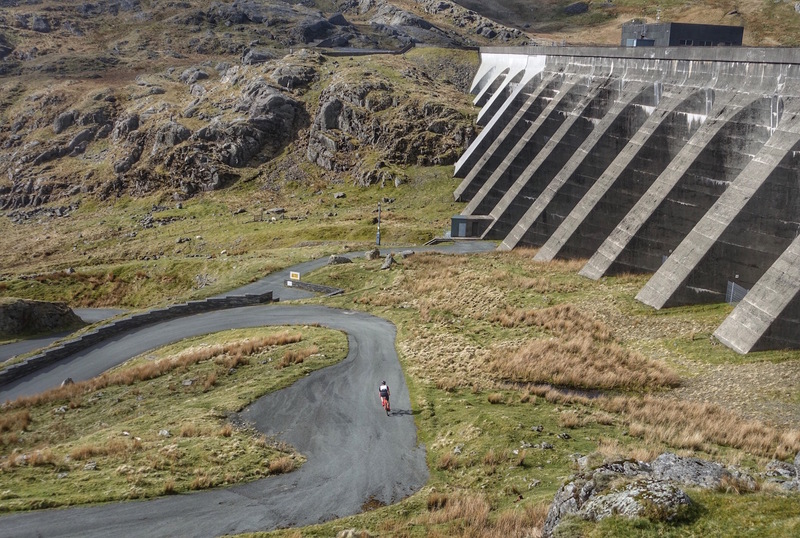 Ride up the very steep road until you get to the dam. Take the right fork and keep going until the road runs out. Simple. 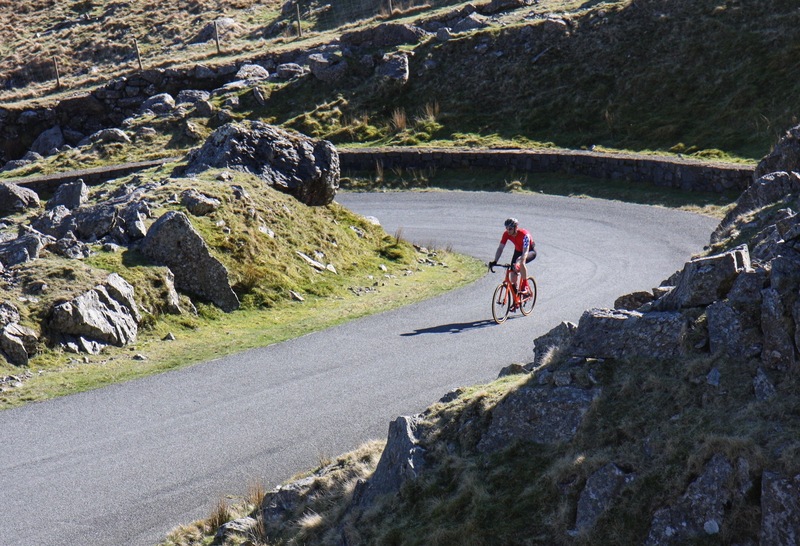 It was a cold, windy February day and the cloud cover barely left the top of the climb clear, but even that was enough to confirm that Simon had lifted the lid on a remarkable ribbon of tarmac – a hard, sinuous climb, in a stunning setting. The very top of the climb, or the start of the descent. 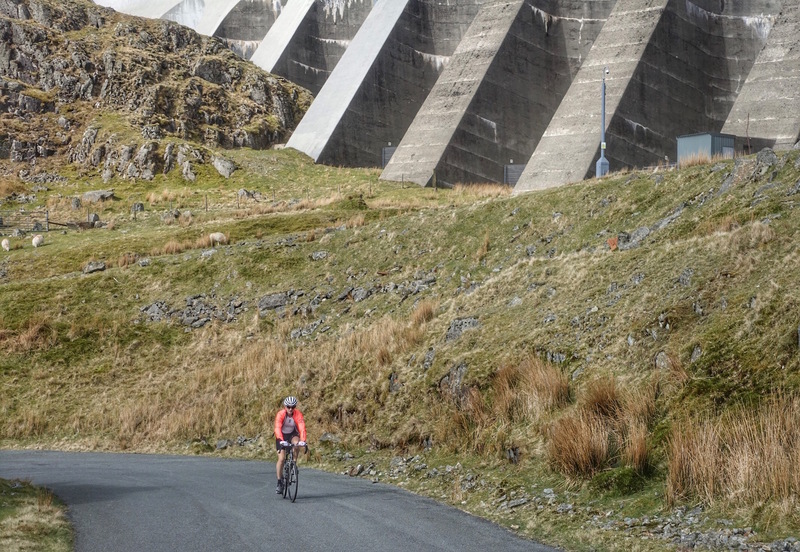 Stwlan Dam and the 16% section – which felt much easier going down, than up! I drove home that evening, already doing the HELLS 500 maths in my head: 270m of ascent per lap, would mean 32.8 laps to reach the cumulative height of Everest. At 10.1% average, this would easily qualify as a ‘steep’ Everesting, finished in just 187km (an Everesting in less than 200km is considered steep). ‘Hard’ kept flashing through my mind, perhaps even too hard, but I tucked it away for a future attempt. This needs little explanation: basically, red is bad. I also started watching the weather: it rains a lot in north-west Wales. Worse still, the climb faces south-west and is very exposed to the prevailing wind. Getting good conditions would be a real challenge. Then, one weekend in October 2017, the wind swung around to the north-east, but I had other commitments and had to let the opportunity pass. A few days later, I spotted a photo on instagram and knew immediately that it was Stwlan and someone had beaten me to the punch. 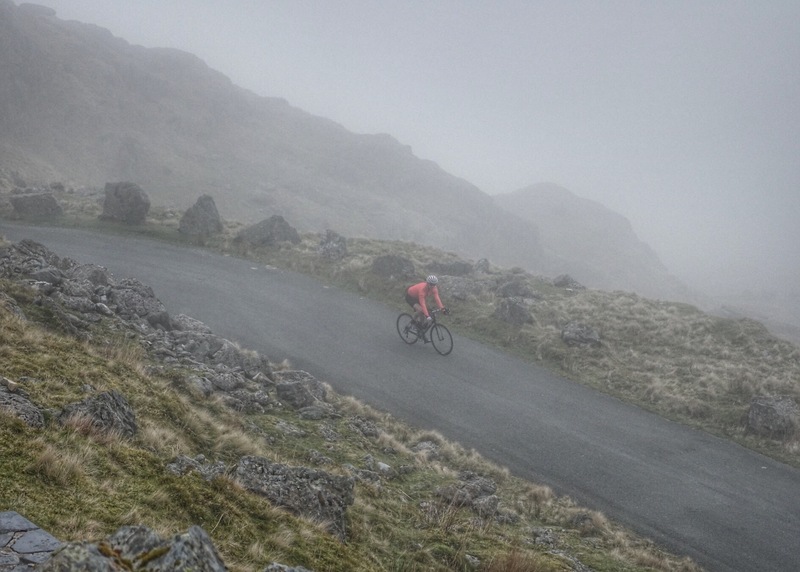 Not just anyone either, but Rich Seipp and his son Tom, aka ‘MiniPips’, who at 12 years old, became the youngest Everester ever – and on one of the hardest climbs! A staggering achievement and one to watch in the years ahead! With some climbs, the singular opportunity to be the first to Everest has been key to my motivation, but with Stwlan, it didn’t matter: I remained drawn to it – to both its difficulty and its beauty. I penciled it into my diary for April 2018. As the date approached, the weather looked highly unlikely. This was relatively early in the year for an Everesting and when it snowed on 1st April, an attempt seemed like months away. However, as the middle of April arrived, so did a brief window of stunning weather. My diary was clear on Friday 20th and I started checking the forecast really closely. I even printed a map of the climb and drew the wind direction on it, hour by hour. It looked like a distinct possibility, with the only issue being overnight hill fog and a slight headwind for the first 12 hours or so. I decided it was ‘good enough’ and started packing the car. Everesting ‘away from home’ isn’t easy: not many hotels or B&Bs are likely to be happy if you try to leave around 2.00am! On previous Everesting attempts, I’d generally started early – around 2.00 or 3.00am – to avoid too much time in darkness at the end of the ride. However, a combination of accommodation logistics, plus research by my son, ‘Coach Tom’ into sleep deprivation and athletic performance, encouraged me to try something completely different. I decided to have a proper nights sleep, a good breakfast and roll out around 9.00am. In theory, this would mean I would feel good for the first part of the ride, rather than bad, which was invariably how I’d felt before, with really early starts. The flip side was that I would have to ride through most of the following night and I wasn’t entirely sure how that would pan out. At 8.30am on an overcast Friday morning and bang on schedule, Kev and I arrived at the gate in the small village of Tanygrisiau, that marked the start of the climb. I parked the car and we quickly got ready. As forecast, the cloud base was low, but it was expected to burn off by mid morning and a few early laps in cooler temperatures were welcome. Kev, descending in the early morning gloom. The sun wasn’t far away though and within 30 minutes of the photo, the sky was completely clear. The climb starts as it means to go on – at 10%! 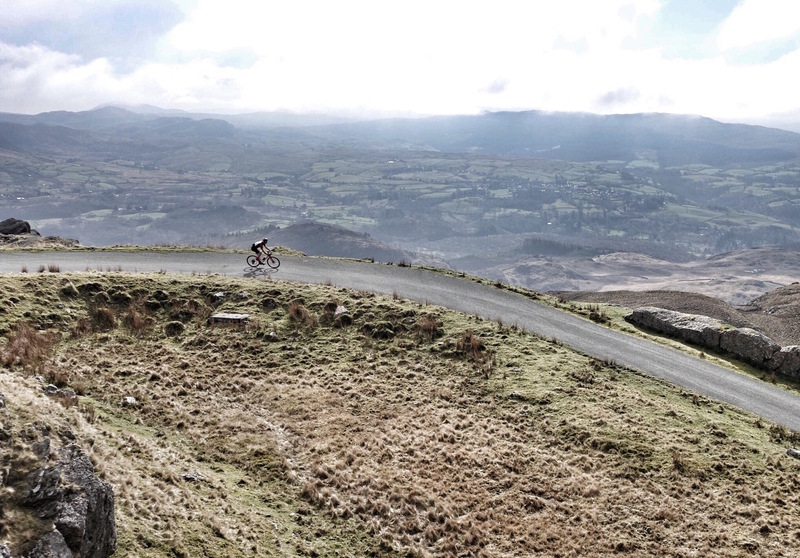 There aren’t many climbs that have you in first gear almost the entire time, but Stwlan does. If you’re not proficient at clipping in and out of your cleats at 10%, you’re really going to struggle to even get started on Stwlan! We chatted, enjoying the riding, the views and the release of expectation and stress. We said hello to the odd dog walker and waved to a few rock climbers on the cliffs above us. The first ascent took just under 20 minutes and the descent about three! This gave me an immediate win on my maths, which had allowed 30 minutes per lap. I knew it was optimistic to expect this pace to continue, but it was a nice way to start. Even stopping for a bite to eat and a fresh bottle still had me on target for 17.5 hours all-in. Kev early in the day (and sporting the new wunder jacket from ASSOS). 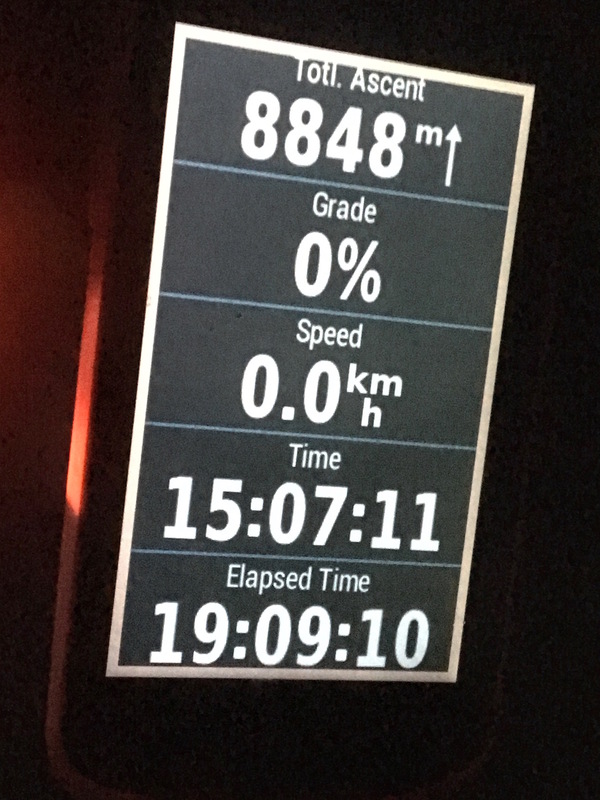 On lap two, I realised that I didn’t have enough gears. Steady 12 – 14% meant my cadence was fixed around 70rpm, when I’d have preferred 80 – 85. I tucked this away in a corner of my mind and firmly shut the door on it. I gave Kev a running commentary on where various heights gained would put us on a real ascent of Everest and then gently challenged him to reach Everest Base Camp i.e. 5,000m+. 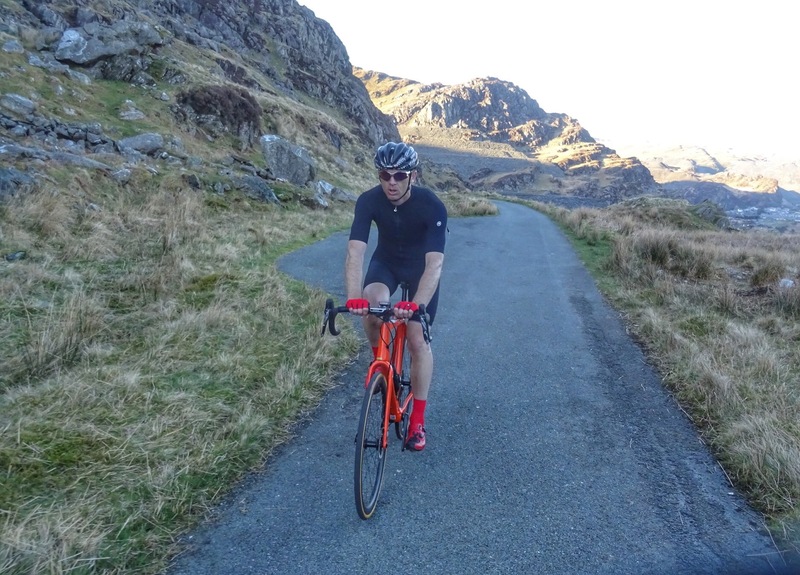 He was still recovering from a major accident in early 2017 and a 5,000m ride would be a really positive milestone on his long road back to full fitness. Considerably easier than the opposite direction! We took pictures as we went, reveling in the amazing views that opened up and as we became familiar with the climb and the descent, we both stopped repeatedly to capture particular images. I lost a little time this way, but it was just too beautiful to ignore my camera. On lap seven, I even carried my SLR up to the dam and left it there, for either of us to shoot the hairpin section from high above. The temperature slowly rose to 24°C , the cloud burned off completely and we just kept tapping away. At lap 14, Kev took a break for some food and getting out of sync allowed us to shoot even better photos of each other. When your legs start screaming, the view helps take your mind off them! How many laps is that then? Ooohhhh, still a long way then! Yes, thank you for pointing that out. As the afternoon wore on, fatigue finally arrived and the attempt took on a more serious tone. The sun sank behind the dam and the road dropped into the shade. The temperature plummeted. The road has fallen into the shade, the temperature is dropping and I’m on my way to a full scale bonk, even though I don’t know it yet. The ride is about to get serious and hard. Somewhere around 5.00pm, a local dog walker introduced himself and asked what we were doing. We explained and it turned out that he, Kevin, had been a marshal on the Tour of Britain for a couple of years. He also quickly noted that we seemed to be climbing a little slower than local hero and reigning British Hill Climb Champion Dan Evans, who’s climbed the road in around nine minutes! A few laps later, Kevin walked back up the road and asked whether we’d like some coffee? I could have hugged him. “You have no idea how much I’d like coffee!” was my response. He made a call to a friend whose house was closer than his own and soon, Kev and I were enjoying mugs of steaming black coffee. I rode another lap while Kev enjoyed his coffee and a natter. I passed three girls walking up the road to look at the dam and caught a waft of perfume. Surreal. The upper hairpins are still in sunlight, but only just. As the day had progressed, my ascent times barely changed at all: 20 minutes up, three minutes down. I hit 20 reps, the equivalent of Everest Base Camp at 5,335m, around 8.00pm. I fitted my Exposure light – the sun had sunk well behind the mountain, shadows had filled the valley and the temperature had fallen like a stone. By my 21st rep, we were in darkness and I mentioned to Kev that I wasn’t feeling great – perhaps even close to bonking. I was hotter than expected, slightly wobbly and nauseous (after the ride, I discovered that my ascent times had suddenly increased by 25% from laps 19 to 22)! We ran one more lap and by the time I reached the top, I knew I was in trouble. With the temperature down to 8°C , I shivered my way down to the car, got in, turned the engine on and dialed the heating up to full. I was shaking uncontrollably and feeling sick. Kev got into the passenger seat and we talked through the possible scenarios: was I getting ill? I didn’t think so. It must be a fueling problem then – I’d simply run out of energy. I’m susceptible to GI issues during ultra endurance events and to combat this, I tend to eat pretty lightly during them. Sat in the car however, it was pretty clear that I’d undercooked it and despite the nausea associated with the worst full scale bonk I’d ever had, I managed to force down half a bagel, half a gel and half a Veloforte bar. The possibility of failure was staring me full in the face. As the minutes passed, I warmed up and the shaking stopped. The problem shifted from physical, back to mental. My chimp was screaming at me to stop. I’d been in the car for 45 mins and I knew that if I didn’t get back on my bike pretty soon, I never would. It was so tempting to just pack up and drive back to the nice, warm B&B. Get out of the car. No, it’s nice and warm in here. GET OUT OF THE CAR. No, let’s just go to sleep back at the B&B. I was fighting my chimp like never before. GET OUT OF THE DAMN CAR. RIGHT NOW. I got stiffly out of the car and flinched at the cold air. I quickly put on a long sleeve jersey and a windproof and loaded up an audio book. I rode lap 23 as slowly as I could, giving myself more time to recover. I made it to the top and then back to the car. More coffee arrived from our impromptu local supporters, along with chocolate bars! Someone put their coat around my shoulders. I could have kissed them! Kev called it a day (or night), as planned, with 5,000m under his belt (in just 103km!!! ), and headed back to the B&B. I pressed play on my earpiece and pointed my front wheel up the road again. I felt bad, but then I pondered how a real climber on Everest would feel on a summit push. ‘Awful’ I presumed. So I was in a better place than that, and should be grateful. I resolved to keep going, unless things got really bad. My ascent times were recovering. The lower part of the climb is almost as stunning as the upper! In the dark, this section of the descent became much slower! I rode another lap. I marveled at the stars and the crescent moon. I concentrated hard on the descent, even though it was now much slower in darkness. Occasionally, I’d refill a bottle. I finished the gel. But I didn’t get back into the car, which I now viewed as a dangerously seductive place, associated with failure. A tray with a flask of hot coffee and chocolate bars had been left by the gate – how amazing were these people!!?? I rode another lap. And another and another. Somewhere around midnight I hit 7,000m. I rode another lap. I refused to stop. The audio book kept me company and the stars filled the sky. Around 3.00am, I reached 8,200m: the South Col on Everest. The so called Death Zone. I knew I was close to success, if I could just hold it all together for another hour and a half. I did two more laps – 31 and 32 – and suddenly, on the steepest ramp at the very top of the climb, 8,848m flashed up on my Garmin. Job done… or maybe not. I actually needed to ride another lap! But I knew that was wrong: I’d ridden the hairpins a couple of extra times for pictures, much earlier in the day and my maths had always said that I needed to ride 32.8 reps to hit 8,848m. 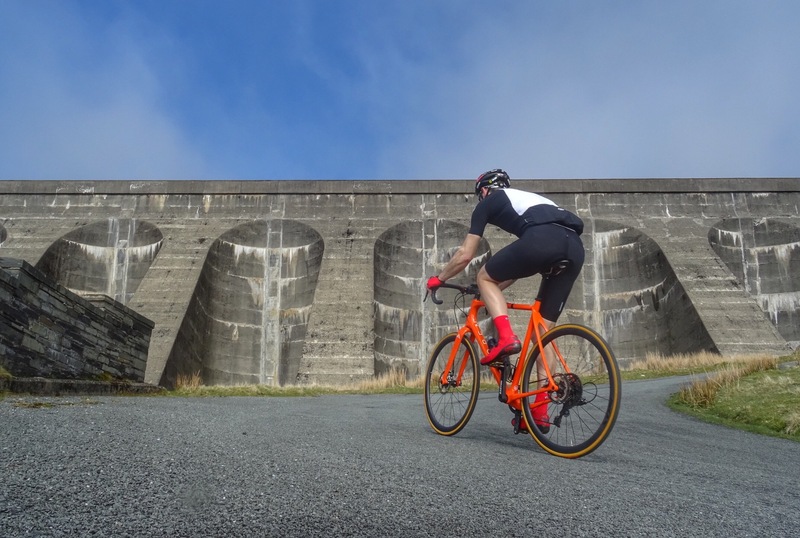 The Everesting Rules clearly state that your height must be gained by riding complete laps, so complete laps it would have to be. I descended and rode one last full lap, carried upward on a wave of euphoria at pulling through a situation that looked really doubtful for a while. I stopped at the summit and noted a slight glow behind the mountains to the east. Dawn wasn’t far away. For the last time I descended through those amazing, hypnotic hairpins. I leant my bike against the gate and hit save on both Garmins. My phone beeped almost immediately to say that the ride was uploaded and I quickly renamed it: Everesting #5: Stwlan Dam. 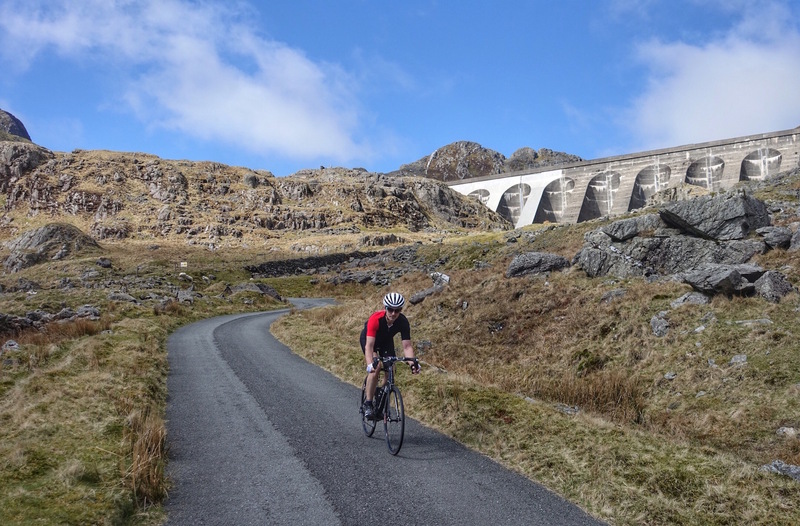 I climbed stiffly into the car and recorded a live update for ASSOS on Instagram and then wrote a thank you note to the amazing folk of Tanygrisiau – Kevin, Leah and her partner (who, I discovered later, had even insisted on driving Kev and his bike back to the B&B). Such incredible hospitality, never to be forgotten. 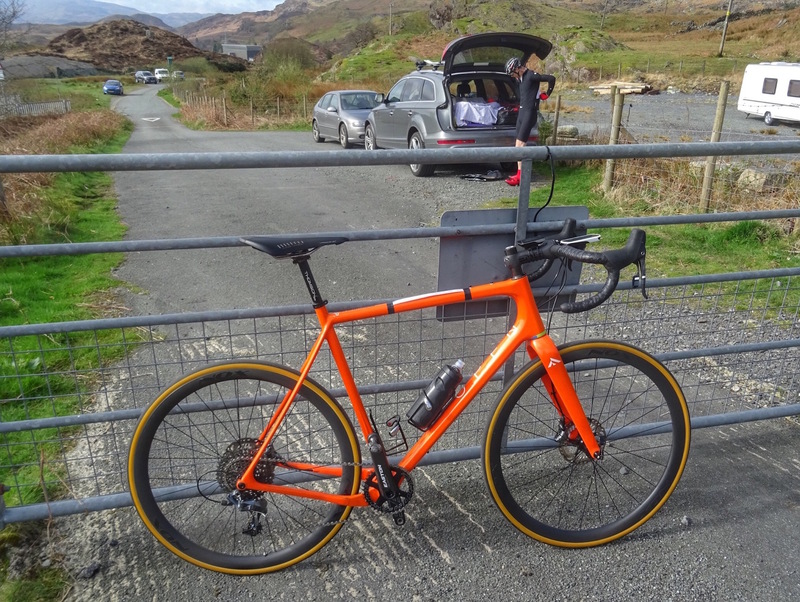 I loaded the bike back into the car and drove very slowly through the deserted streets of Blaenau Ffestiniog, back to the B&B (http://craigddubedandbreakfast.co.uk/ – superb)! Thanks to ASSOS LDN and ASSOS of Switzerland, for their ongoing support. Thanks also to Noble Wheels and Cycle Care, High Wycombe, for building and preparing a bike that was up to the task. As ever, I’m also hugely grateful to Kev for being there on the hill with me for so much of the ride. 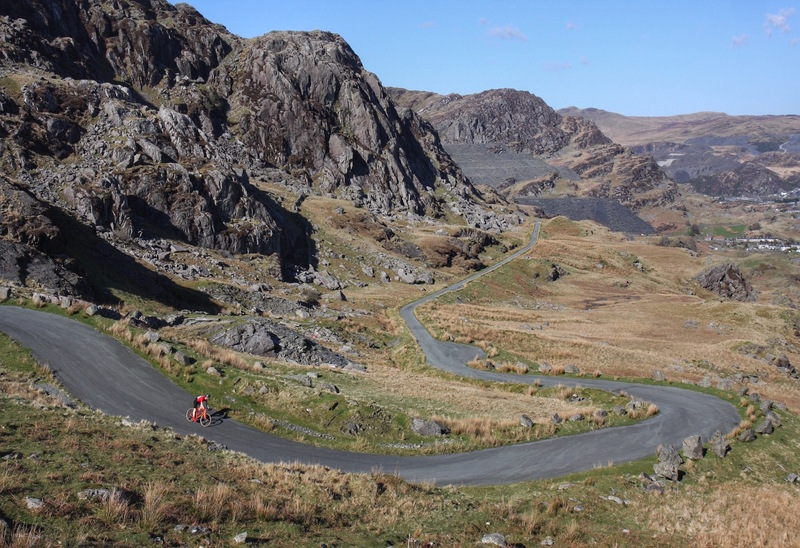 Finally, I’m going to say a very heartfelt thank you and dedicate this ride to the amazing folk of Tanygrisiau, whose hospitality was nothing short of amazing! I rode an OPEN U.P. with a 1X Sram Force set up. I ran a 38T single chaining, with a 10-42 rear cassette. Knowing that the road would be dry and wouldn’t be likely to produce punctures, I used the fastest rolling tyres in the business: Specialized Cotton Turbos (26mm), which were sublime. I only used one front light, which took me from 8pm to 4.30am: an Exposure Strada 6. Amazing! 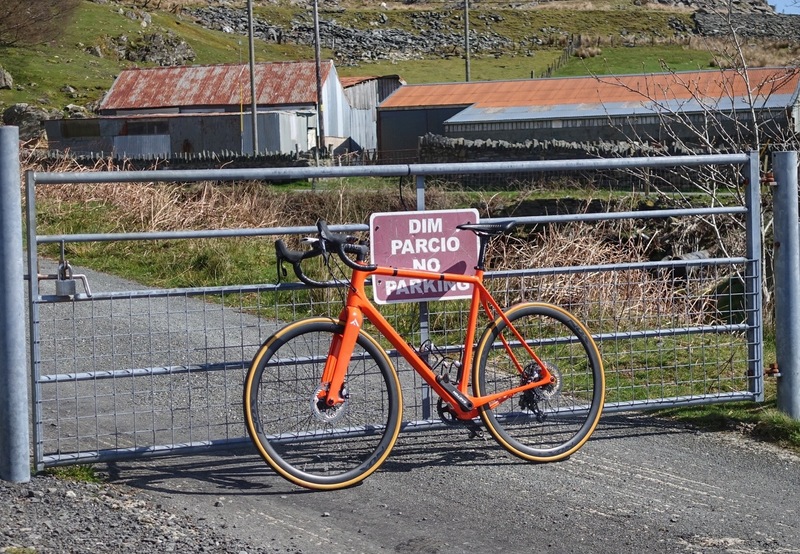 The battery finally died as I leant my bike against the gate at the very end. I stayed in the same shorts all day – ASSOS Tiburu’s and only needed to apply chamois cream twice. I also stayed in the same summer base layer too, but used four different jerseys, to help ‘compartmentalise’ the attempt into sections. After lap 22, I added an ASSOS Intermediate jersey and a Blitzfeeder jacket, which saw me through the night. I used Mille GT socks and a pair of S7 Summer Mitts, which also worked perfectly, in spite of so much climbing. Re’ start time: it was an interesting and broadly successful experiment, but I would have liked to make more use of the available daylight, so a 7.00am start is what I’ll aim for next time. I think the bonk could have been avoided, even though I was treading a thin line between triggering GI issues and eating enough. All I needed to know was my ascent times for each lap and next time I’ll make sure these are visible. The signs were there, I just didn’t have the data on view. My plan has always been to complete seven Everestings. #6 is already in the hopper and with a bit of luck, I might even get it done this summer. Kev, giving it some lean angle, early in the day.